Jalandhar: World-wide known IT Industry, MOTHERSONSUMI INFOTECH AND DESIGNS (MIND) LIMITED and Wipro have selected 35 students of Lovely Professional University under separate selection processes based on written test, Group Interaction/ Discussion, Technical & HR interviews. For this, students of B.Tech CSE/IT, Batch 2012 (Final Year) were eligible. The selected ones will join their duties at salary package up to Rs 3 lac per annum, in the month of June 2012, as Software Engineer/ Technical Support Associate. Congratulating the selected students, the Director General of the University, Er HR Singla guided them to join their duties with a strong will to keep on learning latest skills direly needed in the regularly changing scenario of technology and trends: "Ever continue upgrading your-self so that you may be able to get more in demand opportunities to exhibit your real worth." Motherson Sumi InfoTech and Design (MIND), an IT services company, is a joint venture between Samvardhana Motherson Group and Sumitomo Wiring Systems Ltd. Japan. It specializes in Engineering Design & Software Development, serving clients in more than 27 countries around the world and has presence in all of the key markets including India, Europe, USA and Japan. It is also technology partner with Microsoft, Oracle and IBM. On the other hand, Wipro, one of the world's most trusted brands, is a name that powers itself into new ventures, extending to a series of products, services and solutions that cover diverse businesses - from consumer care to cutting-edge information technology. Two of the selected students Muskan & Jyotsana seemed very happy while expressing: “We were confident to receive the offer as we had adopted all the learning that our university teachers and mentors have provided to us. 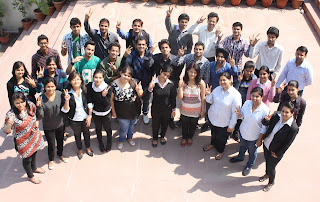 We are indeed feeling great as before finishing our programme schedule, we have coveted job offers with us." Congratulations to all the students who got the job.........wishing better luck for the awaiting ones...hope they are preparing themselfs with full zest.Just ROCK!!!!!!!!! Admissions are over noe. Exams are on the tips.